I will start with some basic configuration options which can prove to be very useful when working with Windows Speech Recognition. To get to these options, start the application and right click on it or on its taskbar icon. 'Play audible feedback' - every time you start, stop, make a mistake, or an important action related to Windows Speech Recognition, a distinct sound cue will be heard. This way, the application draws your attention if something important has happened. There are two kind of sound cues: one is used when you start or stop the application while the other one is used to signal problems when you dictate wrong words and commands that have not been understood by the application. In order to differentiate and understand why you hear a sound cue, you can read the text that appears in the application's message zone. If you want to hear the sounds cues, leave this option checked. 'Run at startup' - will make the application always start when Windows Vista starts. 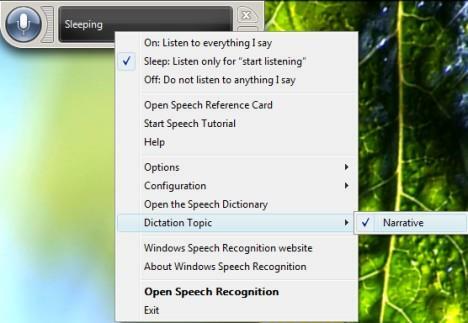 This option is good if you decide to use Windows Speech Recognition on a daily basis. By leaving this option checked you won't have to manually start it every time you want to use it. 'Speak text in correcting dialog' - this is an interesting option which you can use to improve the application. When this option is enabled, each time you correct something you dictated, when using the correction dialog, Windows Speech Recognition will play the sound of your voice that was assigned to that word. For example, if I were to say tutorials and the application would understand tutorial, I would say correct tutorial. In the correction dialog I will hear my voice as it was recorded by the application when it was written. Now, I can change the word identified with the voice I heard myself saying and will make the application improve itself. Although this is an interesting option, the improvements are automatically done even when you don't use it. Therefore, the only thing the option offers is the feedback you receive when hearing your own voice while dictating the word you are correcting. 'Enable dictation everywhere' - if you leave this option checked, you can dictate in any application be it with support for speech recognition or not. However, if an application doesn't offer support for speech recognition, you can only dictate text. You cannot make more advanced actions such as copy, undo, redo. As a reminder, to work with Windows Speech Recognition in an application, it needs to offer support for the Text Service Framework. Windows Vista can be commanded with Windows Speech Recognition because it uses this framework. Other important configuration options can be found in the Options context menu, in the Configuration sub-menu. There you can Set up the microphone, start another speech training session to make it easier for the application to recognize your voice or you can click on Open Speech Recognition Control Panel to quickly get to Control Panel -> Ease of Access -> Speech Recognition Options. 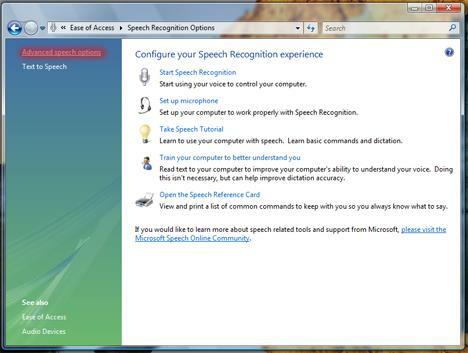 All these options have been covered already in our Windows Speech Recognition Guide. 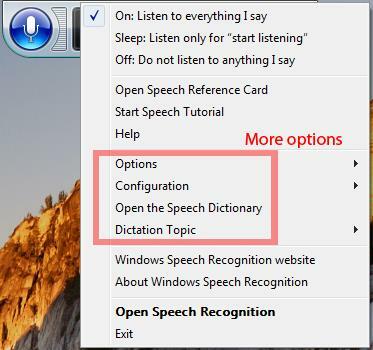 Below Options and Configuration you have the Open the Speech Dictionary option. This can be used to enrich the knowledge base of the application. Imagine that the application is a person that has basic knowledge of your language. If it hears new words, it won't easily recognize them without further explanation. 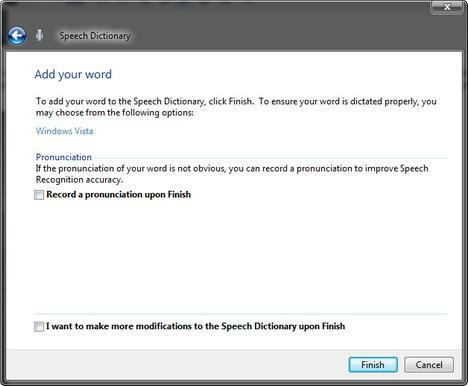 In order for Windows Speech Recognition to recognize a new word it needs it to be added in the dictionary used by the application. To add a word, Open the Speech Dictionary. The first time you use it, you will see two options: add a new word and prevent a word from being dictated. The first option can be used to add new words to the application dictionary and make it more familiar to your way of speaking. The second one will help you block words and prevent the application from reacting to them when you dictated them. NOTE: in the screenshot below you see three options. The third one - change existing words - appears after you created a few rules. The rules that are created can be modified at any time using this option. Next, I will show you how to create a new word. The same rules will apply to the other options as well so there is no need to go through all of them. While you are in the window shown in the screenshot above, click on the 'Add a new word'. Then, dictate the word you want to add. If it is not recognized, correct it. When done, click on the Next button. When done, click on Finish. You can always add Windows Speech Recognition vocabularies for specific domains such as medicine, engineering and others. There are companies such as Trigram Technologies which sell specialized vocabularies to those who need them. These vocabularies will help the application to recognize uncommon words used in specialized fields. If the speech engine cannot understand the phonetics used by you, it will never get the correct word no matter how many words you defined in the default dictionary. 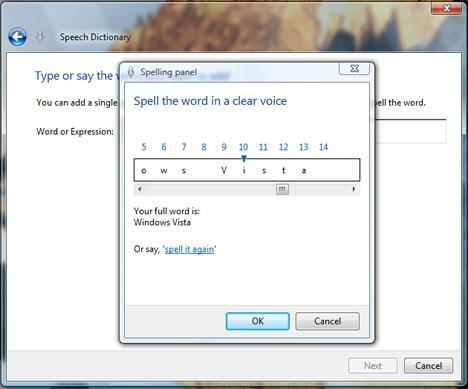 Using specialized vocabularies will make Windows Speech Recognition more accurate. 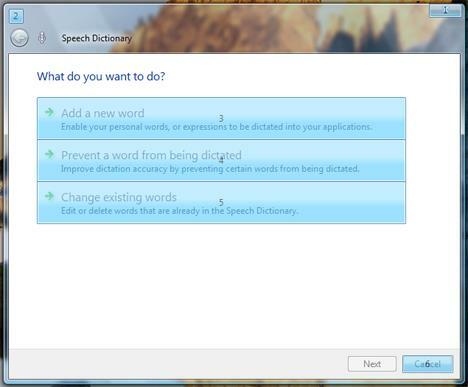 After you install an additional vocabulary, you need to enable it in order for Windows Speech Recognition to use it. To do this, start the application and right click on it or on its taskbar icon. After that select Dictation Topic and then the vocabulary you just installed. NOTE: Every time it starts, Windows Speech Recognition will set itself to the default Narrative vocabulary. Therefore you might need to manually select the other vocabulary each time you want to use it. 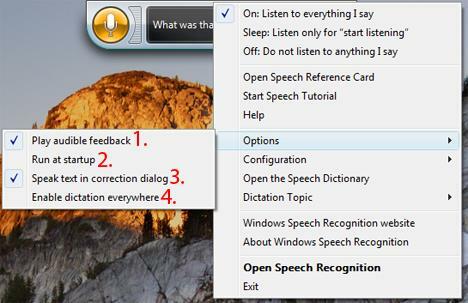 NOTE:When changing the options described below, it is best to have Windows Speech Recognition closed. Restart the application after you have made the changes you want. First, go to Control Panel -> Ease of Access -> Speech Recognition Options. Once you are in the Speech Recognition Options window, click on 'Advanced speech options', in the top left corner. In the Speech Properties window, go to the Speech Recognition tab. There you will have four distinctive functions, as shown below. These are: language, recognition profiles, user settings and microphone. For more details about them and what they do, please continue reading. Even though it is not the first option in the list, I will talk about it firstly, as it is the most important. A profile is basically the collection of all settings and information about how to recognize your voice when using Windows Speech Recognition. Before changing the language used or letting other persons use Windows Speech Recognition it is best to add another one so that your current one will remain unaltered. If another person will use Windows Speech Recognition and you don't create another profile, it will alter the performance of the application and it is very likely to have worse results when working with it in the future. 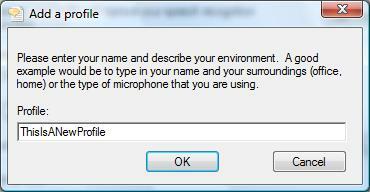 To begin, in the Speech Properties window you have the option to create a new profile. Click on the New button, type the name for the new profile and follow the instructions shown by the wizard. When done, the profile will be created and you can start training Windows Speech Recognition. If you have more than one profile, you can change it just by checking the name of another profile. You can also delete profiles that you previously created. To do this, first select the profile, click on the Delete button and confirm the operation. 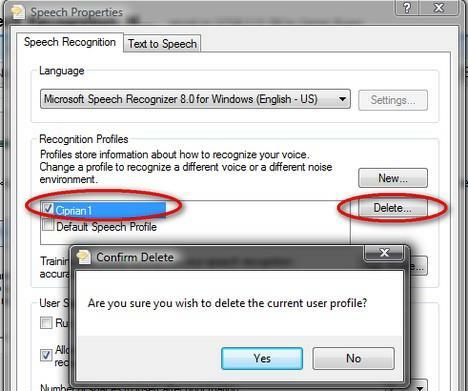 NOTE: Before you enable, disable or delete a profile, close Windows Speech Recognition. Otherwise you will receive an error message like the one shown below. If you want to use a different language than the default one, you first need to install it. To learn how to do this, read our guide on how to change the interface language in Windows Vista. 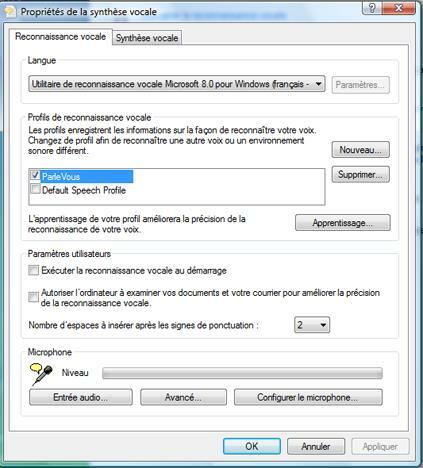 After you have installed and enabled the additional language, in my case French, open the the Speech Properties window again. 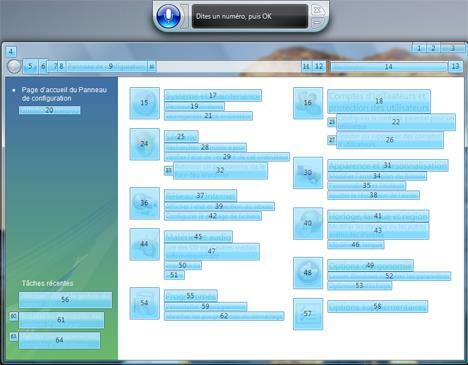 Create a new speech profile as shown above and, from the Language drop-down menu, select the language you want to use. NOTE: The dialog that takes place between you and the computer can only be done if the language used for dialogs and menus by Windows Vista is the same as the language set for Windows Speech Recognition. Imagine, for example, saying welcome to a French person. While the French person may probably understand, the computer will be confused because it awaits only for the French word for welcome. Now, when opening Windows Speech Recognition, the new language will work properly. If it does not work, redo the steps and make sure you have the Windows Speech Recognition closed, have set the language correctly and checked the correct profile. 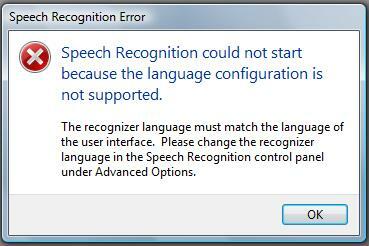 The next time you open Windows Speech Recognition it will work with the new language that was set as default. All that remains is to take the tutorials using the new language. Details about how to train can be found in our Windows Speech Recognition Guide. 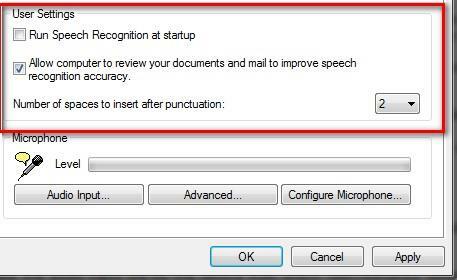 The next set of configuration options from the Speech Properties window allows you to start Windows Speech Recognition automatically at startup and to use your documents to improve itself. The last setting is about how many spaces Windows Speech Recognition will add after the punctuation you dictate. The default value is 2 and can be changed from the drop-down list. 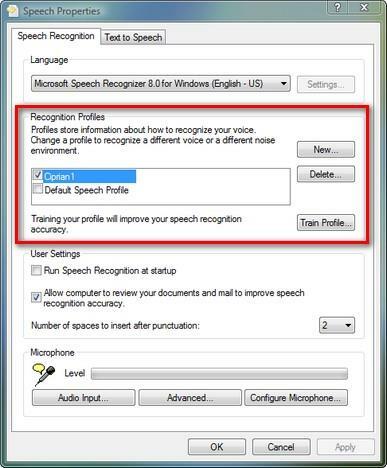 The last set of configuration options from the Speech Properties window allows you to configure the microphone used by Windows Speech Recognition. 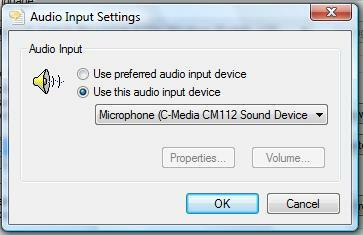 If you click on Audio Input it will open the Sound window where you can configure the microphone device you are using. To learn how to do this, check our previous tutorial on this topic called How To Install and Setup a Microphone. The Advanced button, when clicked, will allow you to change the audio input device. You can change this to use a device only with Windows Speech Recognition while keeping another microphone device for other uses as the default. If you don't have such plans, leave it set on the 'Use preferred audio input device'. 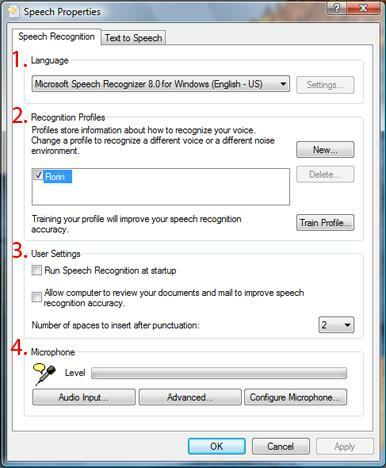 The 'Configure Microphone' button opens the Set up a microphone wizard from the Windows Speech Recognition Options. More information on how to setup your microphone to work with Windows Speech Recognition can be found here. As you can see from this article, Windows Speech Recognition is a very versatile tool with many configuration options which can help satisfy your needs. If you have additional information on how to configure and work with this tool, don't hesitate to leave a comment and share it with us and our readers. There are many people who will find it useful as there is not much in-depth information about how to work with this tool available on the Internet. I had soo much problem with speech recognition, this helps a lot.. thankx!!! This tutorial was EXTREMELY helpful. The Win 7 voice recognition from Microsoft has the same problems and compensates for this issue by creating a 'text box' to put your spoken words in to and to add those words to a program you've to press enter after each set of words. While this is based on the beta information this doesn't mean that they aren't going to change it later, but I doubt it. Voice recognition is getting much better and with 64-bit systems and their resources, I think the voice recognition is going to excel. The training text provided is very limited. It would be good if you could read every word in the Dictionary to it so you could train it really well. Is there a way to do this or to get more text to read to the computer? continuous speech has many features that alter the sound of words as single entities so I would guess that reading every word in the dictionary wouldn't necessarily be much of an improvement. In continuous spoken speech you have blending (word boundaries changing), elision (omission of parts of word sounds), assimilation (sounds in words change). I'm sure the training text is designed to capture all phonemes and much of the variations that blending, elision and assimilation create. Also, your general working vocabulary is so limited compared to what's in adictionary that reading every word wouldn't be effective. Best to simply correct/train problem words as you go along.